How much Height Elevator Shoes can add? Elevator shoes are specially created for short men to give them height enhancement. The best thing about elevator shoes is that the height increasing mechanism is totally hidden inside the shoes. A pair of well created elevator shoes fully merge together with your apparel can bring an impressive transformation in your appearance. It makes wearer instantly feel more confident of their height so if you are feeling bit insecure or less confident due to your short height then it’s time to wear a well created pair of elevator shoes. Upper - The upper is designed to accommodate the thick insole. It has more slopes between the face and the post. Insole – This is the magic element to improve height. The insole can be made from plastic, foam or cork. Mid-Insole – This insole acts as a buffer between insole and outer-insole. It delays the slump of the insole and provides aeration. Outer-Soles – This part allows a natural instep thus, reducing uncomfortable feeling. Elevator shoes are assembled with the quality, style and comfort level. But the question that might be crossing your mind is: How much Height Elevator Shoes can add? Now-a-days height increasing shoes are coming in many sizes, forms and styles such as formal wear, casuals, work place. So, you can choose from huge collection. Elevator shoes height ranges from 5cm to 9cm. The shoes are categorized and are sold based on the exact height wearer wants. So, the basic specifications are 6.5cm, 7.5cm, 8cm and 8.5cm and in inches specifications will be 2.75”,3”,3.2” and 3.4”accordingly. If you're a beginner, it is good to select elevator shoes that can give you 2-3 inches height gain. The ideal height increase in formal shoes for beginners is a pair of.5 to 2.6 inches and it will go up to three inches if you're an everyday user. Sneaker shoes sole has no heel; the sole thickness towards the girth and the ankle is same inflicting our feet flat on ground. So the ideal height increasing sneaker shoes for beginners is 2 inches and this may go up to 2.5 inches if you're a daily user. Casual shoes might not have heels but the outer sole is usually thick. Even if there is 1 inch increase in heel, the slope won't affect much. Thus, the ideal height for a casual shoe for beginners is 3 inches and it can go up to 3.5 inches for regular basis. 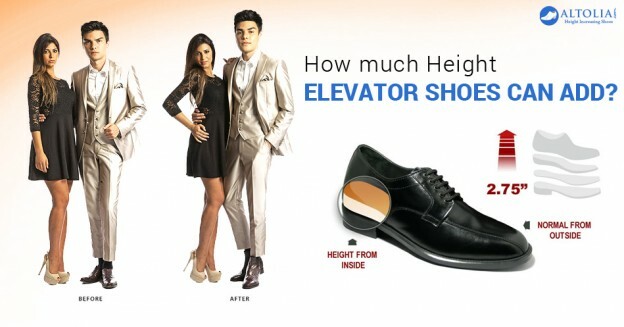 Before buying elevator shoes make sure it goes with the requirement of your height. The whole idea behind designing such shoes is to assist wearer look taller without distressing the foot comfort and style quotient.